Don’t forget to leave your response at Booking Through Thursday! The one I’m just finishing – Ophelia Joined the Group Maidens Who Don’t Float: Classic Lit Signs on to Facebook. Hysterical! Maybe less funny to those who don’t belong to the Facebook group “Facebook is My Heroin” but this is funny to me. Beyond that, I think the previous fluff book was The Temptation of the Night Jasmine back in January. I remembered the effect that the view of the tremendous and ever-moving glacier had produced on my mind when I first saw it. It had then filled me with a sublime ectasy, that gave wings to the soul, and allowed it to soar from the obscure world to light and joy. We start Frankenstein next Monday, August 31, at Literature by Women. Come join us. BNBC’s August First Look Book Club has been reading Shandi Mitchell’s debut novel Under This Unbroken Sky. Set in 1938 rural Alberta, Canada, the novel examines one year in the life of a Ukranian immigrant family struggling to make a home for themselves, breaking the land to suit their will. There are moments of levity, happiness, and joy but also madness and tragedy. The novel is overshadowed by an opening preface, one that describes a photograph dated 1933 (there wasn’t an actual photograph my ARC so I’m not sure whether there will be a photograph in the actual book); as readers, we are told that within five years of this photograph this farm will not exist and three members of this family will die. Mitchell’s novel describes the road to tragedy beginning with the day Teodor returns to his family after serving two years in prison for theft, the “theft” being the crime of keeping one wagonload of grain for himself instead of letting the entire crop be repossessed and his family starve. Teodor’s wife Maria has kept their five children alive, staying in a shack on her sister-in-law’s property. Anna has trouble of her own in the form of her drunken, egomaniacal husband, Stefan; Anna’s psyche is close to breaking. Reading Mitchell’s novel is a little like reading My Antonia on the other side of the mirror, a The Long Winter that reveals the devastating truth of prairie life. We are not looking in on the Shimerdas, we are behind the scenes with them, building houses, negotiating sale prices (with poor English), rationing food to last the winter, saving crops from natural disasters. We are not warmed by Pa’s fiddle but listen to Maria’s stories from their homeland now torn by Stalinist directives. It is easy to forget the setting is only 80 years in the past because there is no electricity, all the farmwork is done by hand. The novel highlights the difficulties of the immigrant. The locals take advantage of the immigrants’ naivete and poor English skills. Come to our country! You can own land if you work hard! What they really mean is that once you have the land broken some loop-hole will appear allowing your homesteading claim to be revoked. The grocer will try to cheat you when buying the vegetables you have slaved over. It’s an odd form of indentured servitude. I felt a twinge of relief or guilt that the book was set in Canada, like the sins of the US during the western expansion are not ours alone in the history of the Western hemisphere. With so many characters in close quarters with one another Mitchell really should be proud of her ability to give each of her characters a unique voice. Maria quickly became my favorite character. She is practical and endlessly resourceful, the ideal character for a novel centered on the hard life of a settler. The knowledge of cooking, farming, home-remedies, sewing, etc. packed into her head could fill several instruction books. She is an admirable character and a stark contrast to her sister-in-law, Anna, who is nearly incapacitated through self-loathing and hatred for her husband. I would love to see how Teodor and Maria’s children turn out, if Sofia succeeds in shedding her Ukranian roots, Myron becomes the land-owning farmer his father intended, or if Dania creates as solid a home as Maria had, but Under This Unbroken Sky is a book that shouldn’t have a sequel. August is nearly over (and it’s freezing cold here in Iowa – 60 degrees when it should be 90) so Literature by Women is wrapping up its discussion of Nadine Gordimer’s The Pickup. The novel revolves around the relationship between Julie Summers, white, native South African, and Abdu, illegal immigrant from an unnamed Middle Eastern country. This has been one of our harder titles to discuss. I’m not quite sure what to do with it and since I’m the moderator my indecisiveness doesn’t help. That’s not to say it’s a bad book. Gordimer has an interesting style in this book, eschewing punctuation as regards dialogue, and it makes the book very chatty, like you’re in a crowd with people talking all around you and it’s up to you as the listener to sort out who is saying what. She also brings up an interesting point regarding the plight of the immigrant; if no other country wants you, and all you want is a better life, you are reduced to the status of a refugee begging entry unless you have the silver to cross another’s palm. Julie does irritate the heck out of me, less so near the end of the book, mostly due to the poor-little-rich-girl-who-appears-to-refute-her-family’s-status-because-she’s-pretending-to-be-bourgeois-but-really-still-benefits-financially attitude. Julie is really very aimless. All Julie and The Table do at the El-Ay Cafe do is moan about varying plights of the people of the world and still don’t seem to do anything but talk. When Julie does grow a spine and insist on going with Abdu I was heartened only to realize she doesn’t know anything about Muslim habits. She doesn’t even think to pack modest clothing; even I would know to do that. She does eventually find a purpose and definition to her life and even though that isn’t even remotely the life I would choose for an educated woman it does work in this instance. This was an interesting book to read even though I had a difficult time finding an angle to discuss adequately. I think this was due to the setting; it felt something like the US but then it obviously isn’t set in the US, it was in South Africa and that changed how I was relating to the characters. Particularly Julie. This one definitely needs a re-read sometime in the future. Next up for LbW: Mary Shelley’s Frankenstein. Come join us August 31. Amid the promotion for the release of the movie adaptation of Audrey Niffenegger’s The Time-Traveler’s Wife (briefly reviewed last September) a number of us garnered advance copies of her new novel. Her Fearful Symmetry goes on sale in the US September 29 and revolves around two pairs of twins, the nature of existence, and a ghost story. That’s all I can really add to the plot beyond the blurb, which you can read on any product page, before I start giving too much away; HFS differs greatly from TTW in that there’s really no good way to describe the plot (that one was easy – man with involuntary time-traveling issues meets woman who eventually becomes his wife despite the inherent problem of his disappearing suddenly for varying lengths of time). I’ve been mulling over HFS all day and I can’t quite put my finger on why I can’t quite rave about Niffenegger’s second novel. It was good; I liked the way she described her characters and I loved the bits about Highgate Cemetery since I’m a good little Victorianist but there’s something that grates on me regarding the resolution of the novel (as well as the fact that I am slightly weirded out by the supernatural because there is a part of me that does believe we exist beyond the moment of death). Obviously, I can’t get into the problem of plot resolution because 99.9% of the world hasn’t read this and it would be really (really) inconsiderate if I spoiled the whole plot for everyone. HFS reminds me very much of Wilkie Collins’s The Woman in White with all the doubling and “Other” Niffenegger uses in her novel. HFS is both Victorian in feeling and not Victorian, Gothic in some respects but not very much in others. If you are decently well-read in Victorian novels there is a very good chance you’ll guess one of the plot devices very early on; I had it pegged from about chapter three or four. Of all Niffenegger’s characters in HFS the one I feel best-drawn is Martin, the crossword-setting, scholarly upstairs neighbor whose life is almost completely subsumed by his OCD. The way Niffenegger has allowed Martin to both acknowledge the reality of the problems caused by his OCD and be completely controlled at times by his disease is interesting. It’s like we are allowed to see the two sides of the brain – rational vs. irrational – fighting it out with Martin’s OCD. I also find the relationship between Martin and his wife, Marijke, very touching. The other characters seem either too generic or too fantastic or (as strange as this may sound) too bizarre next to Martin (the subjects Niffenegger has Martin cover in his crosswords are absolutely amazing); in the case of the twins I thought they were the worst stereotype of lacksadaisical American teenagers with too much money until about halfway through the novel. I did like this novel quite a bit. I’m not sure I’ll rush out and buy it on the release date but I think this definitely deserves a re-read at some point in the future. “Bookspotting” is something I used to do for fun on the old “Book Explorers” board at BNBC (it was moderated by Ande from the Literary Ventures Fund); I called it “booksnooping” then but since I’ve just finished Trainspotting – and I think the correct term is “trend-spotting” as far as fashion goes – I like “bookspotting” better. Since the “Book Explorers” board is no longer active I’ll just Bookspot on my blog and share what I see others reading in the Iowa City area. The rules for Bookspotting are very simple: spy on your fellow humans to see what they are reading without actually bothering them to ask for title and author. Don’t forget to leave a link to your actual response at Booking Through Thursday! I totally had to rip the title of this post off of the old University of Iowa fundraising campaign. Couldn’t resist. The best book I read recently is The Girl Who Played With Fire. Hands down. No arguments. If I have to stay up until 3am to finish the book, it wins. 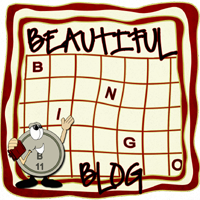 Ryan from Wordsmithonia gave me the B-I-N-G-O Award yesterday. Awww, thanks Ryan 🙂 He’s a pretty cool guy AND he’s a very involved participant at Barnes and Noble Book Clubs. If you haven’t yet visited Ryan, Rebecca, SKrishna, Cathy, Pam, or Kristi, you really ought to!